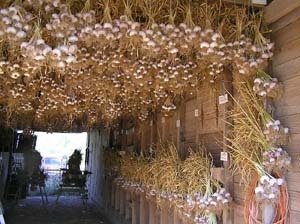 Like all Creoles, it is a long storing garlic. Harvest in late spring/early summer...stores well into spring. Spanish Benitee is an interesting Creole that has a nice pleasant garlickiness but with some pungency. It is a lot more pungent than Burgundy and about as pungent as Ajo Rojo. This is a hot garlic when tasted raw. It has a pungency rating of about 8 or 9 on a scale of 10 and a garlickiness rating of about 6.